Somewhere Between… | OFF KLTR! There is a movie called Somewhere Between. 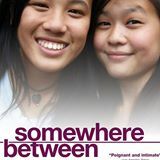 It’s a documentary about Chinese adoptees and how they often feel like they are living between two worlds. They feel like they don’t really fit into their adoptive families’ (primarily white) worlds, nor do they fit into their birth cultures. For many years, I found this this idea – this feeling – intolerable on behalf of my daughters. But, by taking this kinesiology/shamanism class (quite a combination, huh?! ), I am feeling called to really face my own fears. And one of my greatest fears is not fitting in. Being outside of/different from the people that I am surrounded by. And that is exactly how these adoptees in the documentary seem to feel. In college, my eyes were opened to a level of wealth that I had no idea existed. I thought it was only in the movies that kids drove expensive sports cars!! Then, living in Boston/Cambridge after college was so much fun! But the population is very transient. It was never “home”. And then when Rob and I got married, we moved to Sharon. There, we had some wonderful, amazing neighbors – who we still miss! – but, I just didn’t feel at home there. I thought perhaps it was because we were in the religious minority there? Financially, I think that we were right in the middle there. But there was a very wide range. I don’t know how else to say it, but I never felt at home – really, really at home – in Sharon. And so we left…and we moved closer to the city. And again, we have the most wonderful neighbors. A very beautiful street. We can walk downtown. But now that we’ve begun homeschooling, it feels like I’ve found yet another way to prevent our family from truly weaving ourselves into the fabric of the community!! And it feels bad. People here are so nice. When I explain where we live they say, “oh, you go to Bishop (Elementary School)!”. They are genuinely looking to connect! And I have to tell them, “no, we homeschool”. Even though I try to put a big, friendly smile on my face as I say this, it frequently ends the conversation. So often I ask myself, what the f*ck are we doing? Why can’t we just do what everyone else is doing? But look at what happened when I joined the coop for a summer (note: the coop doesn’t even meet in the summer!). I dis-integrated, because the coop wasn’t a perfect fit for us this year. It’s not all that far off! But, it’s just not right for our family now. To say the least, there is a markedly wider gap between the public schools and how I’d like to educate my children. But, if I could just go along with society, wouldn’t it be so much easier?? Well, yes in some ways. But on the other hand, how can I not live my truth? Ignoring my heart and doing what everyone else is doing wouldn’t make me happy either. And so…I am living somewhere between. I live in this community, but I am not really a full member of it. By following my intuition, I have lost that comfortable feeling of belonging that held me through my childhood. At church last Sunday (yup! I was at church on Sunday! how ‘ya like that? ), the minister spoke about “Where to Find the Holy” and she theorized that you find the holy in that place that is somewhere between. Where you are not a full member of any place/culture/community. And I think she’s right. When you purposefully decide to go against the cultural norm, you have to think and (more importantly) FEEL for yourself in order to find your way. And the only way to do that is to get quiet. You have to get quiet to ask for and receive guidance on what in the world you should do next! When we are in constant motion, we are distracted from ourselves. We need to be quiet to hear our inner voices. And that is why I educate my children at home, so that I can be a quieter human being and mother. A mother who intentionally slows life down. A mother who, when quiet, teaches her children to listen to their own inner voices and feelings. And that is the gift of the somewhere between. So now I can tolerate thinking about the Somewhere Between movie about the Chinese adoptees. I know how it feels to live in my own somewhere between. I do not know how it feels to be a different race than my mother and father. You cannot tell from looking at me that I am a homeschooler. BUT I am learning that what you need to feel truly at home wherever you are is to accept and trust yourself unconditionally. And I cannot help but hope that when I reach that TRULY utopian place – a place of peace with myself – that my children will learn the same lesson and their gift will be to feel truly at home wherever they are – in Boston or Beijing. From my computer keyboard to God’s ears!!!! So well done as always! Hugs from here to there and anywhere in between! I think we all struggle with this. I try to remind my self everyday to be IN this world, just not OF it. (A spin off of Romans 12:12) Be proud for wrestling with life’s contradiction, rather than opting to be ambivalent. So glad to see you back to regular blogging! This is such a great post and speaks to the very real need for all of us to find and foster community. I often think how much more challenging it would be for us if we homeschooled in a place that had neighborhood schools. Luckily for you, your town is inundated with homeschoolers!! Thanks, Kerry! You know, it’s funny, there are so many homeschoolers in Arlington and yet, there are no park days in town. Huh? Well, I suppose it’s just another opportunity for me to give something to the homeschool community! Opportunities abound! !